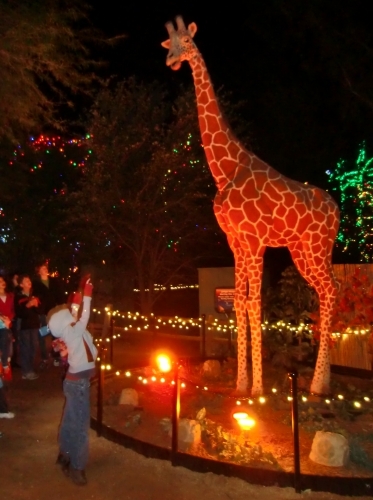 If you will be in Phoenix, Arizona during the holiday season, you absolutely must visit Zoolights at the Phoenix Zoo. Go here to see a twinkling array of animal-shaped light displays, watch dancing trees, chat with a talking giraffe, try snowless sledding and more. 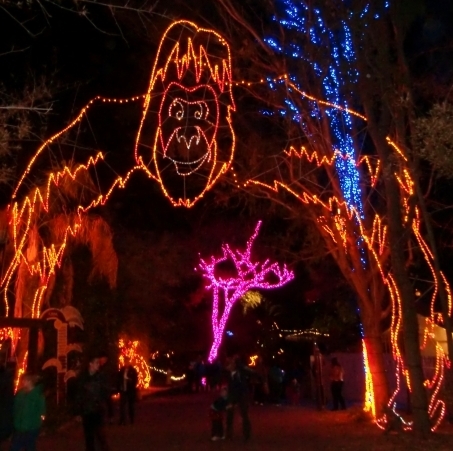 You’ll see forests of bright purple and white lights, cacti decked out in a rainbow of colors, and a multitude of bright animals lit up by environmentally-friendly LED lights. In total, there are 3.5 million lights and 600 light sculptures! Kids are amazed by Jengo the Talking Giraffe, especially when she calls them out by name! Jengo’s neck, mouth, and tail move as she chats and sings holiday songs with Zoolights visitors. Who says you need snow to go sledding? 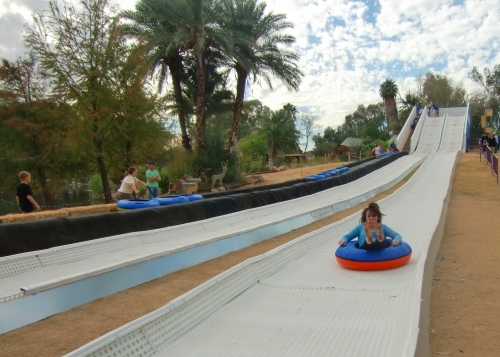 At the Phoenix Zoo you can zip down the Polar Slide aboard an inner-tube during daytime zoo hours and Zoolights evenings throughout the holiday season. My kindergartner had an absolute blast zooming down this 180-foot snow-free hill. Even my usually ride-phobic toddler begged to join in the fun, but riders must be at least four-years-old. Grandpa appeased him with a visit to the zoo’s nearby Virginia G. Piper Enchanted Forest playground instead. The Phoenix Zoo’s Arizona Trail is home to this state’s indigenous creatures. The Zoolights in this area focus on the same animals. Here you’ll find bright displays of jackrabbits, Javelinas (wild pigs), a giant rattlesnake, and other desert inhabitants. 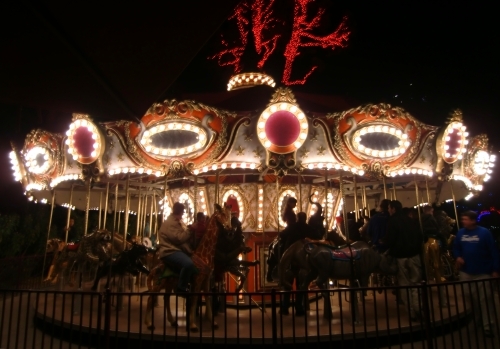 As though that’s not enough, for a few extra bucks you can go for a ride on a real camel, take a spin on a carousel, or climb aboard a horsedrawn carriage for a tour of the lights. Plus, Santa is available to pose for Christmas portraits with children at an additional charge. This is a wonderfully festive event to share with children or to enjoy as a romantic date night with your honey. Tickets can be purchased online at a discount. Visit the Phoenix Zoo website for additional information. Where is your favorite holiday light display in the world? Share your thoughts in the comments! 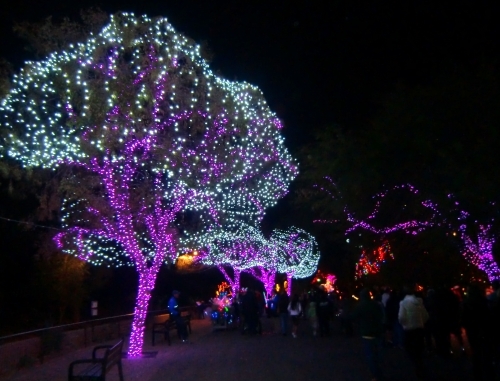 A Note from The Travel Mama: The Phoenix Zoo provided my family with free entrance to Zoolights. This looks like a lot of fun. 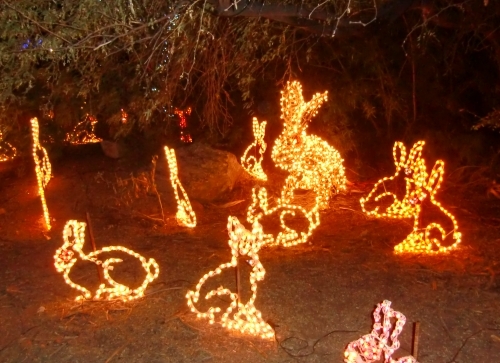 My favorite holiday lights display near home is right outside the Los Angeles Zoo. I was sad to discover that budget cuts have canceled the show indefinitely. 🙁 Looks like I need to discover a new favorite! We try to catch this every year. The talking giraffe is definitely a favorite. I’m glad you guys got to see this during AZ Thanksgiving trip 2010! I have to say the talking giraffe is pretty awesome. When it called Karissa out by name she wasn’t sure whether to be amazed or scared…amazed won out. The giraffe had a great funny personality which kept the kids and us entertained. Nice. Your night photos were amazing! On cold nights the hot chocolate sold at the zoo is always a favorite. Too bad the water in the stingray tank is too cold to put your hands into at night. Wow, this looks like a a lot of fun! Just visited Phoenix for the first time over Thanksgiving and thought it was a wonderful place!